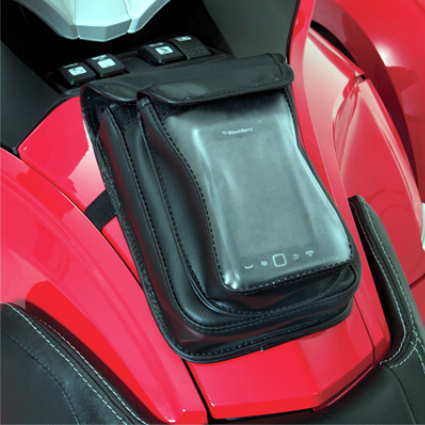 Hopnel™ introduces a new Premium Double Tank Pouch for the Can Am RT that slips over the glove box door. Its felt lined back panel avoids scratches to the finish and the double pouch design with UV stabilized clear face allows access to cell phone screens or GPS display. The large main pocket is zippered and measures 5 ¼” wide by 7” tall and 1 ½” thick, with the clear pouch measuring 3 ½” wide by 6” tall by 1” thick. Fits Can Am Spyder RT.